It took several days, but the wind has finally eased off and backed a little bit more to the east. (105 degrees T in the GRIB forecast is OK, 100 and less is better, higher than 105 and the chop is in the anchorage). We had nearly one full day where the wind was in the 30 knot range and about 115 degrees. Nobody left the boats and we had both GPS's on with the anchor watch set tight. One boat dragged quite aways, dragging his anchor out of the shallower area into 50-foot deep water, but he was dragging back towards a reef. Finally at about 4am he stopped moving. In the morning he had a friend take out a second anchor upwind. Amazingly, for the conditions, no one else had any significant problems. The young couple on Saviah are on their first cruise and are really very green. The boat came with that anchor, a nice big heavy plow. So they had no idea what a risk they were taking trusting their boat to that anchor. Another cruiser in the anchorage was overheard saying "Both my primary and my backup are stainless steel anchors and look just like that!" The break occurred at the end of the shaft just in from the shackle, but in looking at all the rust, cracks, and crevice corrosion around the blades and the head-to-shaft connection, it could have let go anywhere. Latitude 38 should have a separate Puddle Jump seminar on anchors and anchoring techniques. Our advice is "Leave the fancy electronics at West Marine and instead invest in a '2 sizes up' anchor, chain, and windlass system." For our 44-foot somewhat heavy somewhat beamy cruising boat, we have an 88-lb Delta anchor, heavy chain, and swivels and shackles sized (breaking strength-wise) for the bigger anchor. If we were buying a new anchor, it would be about the same size, but probably one of the newer designs like the Rocna or Bugle. THEN, you have set your anchor WELL. Make sure it is in sand, upright, and BURIED. Back down at full RPM for about a minute, making sure the anchor is under full strain before you ease the throttle. If it drags under those conditions--great--you know you would have dragged at 2am in a squall. Reset it until it is set. Visually inspect it to make sure it is set (every time, if possible). Put out at least 4:1 scope. Then, if in heavy coral, put some buoys to hold the last 50% of the chain above the coral. (That heavy anchor will do no good if your chain snaps due to being wrapped up short around a coral head in a heavy chop). OK, off my soapbox. With the nicer weather, we've finally been able to go snorkeling again. Yesterday, since it is still somewhat choppy, we stayed close to the anchorage. We found some pretty nice coral and small fishies around the reef behind the boats. Better, in my opinion, than 'Perfect Reef' 3 miles away. Today we hope to go further afield--people keep telling us that the area up by 7 Islands has some excellent snorkeling and diving. But these are 3 miles away across the open lagoon, and we can't take the big boats (due to park regulations). With the break in the weather, several boats are leaving today. The current boat count is 14 boats, and it has been holding pretty steady around this number, with boats dribbling in and out. We understand from friends in Bora Bora that there's a new slug of boats holed up in Bora Bora waiting for a break in the weather to head this way, so they should all arrive in a group in 5-6 days. Boats seem to move in waves around this area--centered around the short periods of settled weather. We are going to hang here for probably another week. We have decided not to go to Niue and Beveridge reef, which would have been 500 miles out of our way, and so we have plenty of time to enjoy Suwarrow and the Samoas. We spent nearly 24 hours with the winds blowing here at 25-30 knots, with the highest gust recorded at 42 knots. And from a direction in which we are getting no protection from the near reef--only from the rim of the atoll several miles away. Our friend Kennedy on Far Star, a single-hander, dragged about 80 feet in the middle of the night, but fortunately he had dragging room and did finally stop dragging at about 4am. Once daylight came, he, with the help of a friend, set another anchor. The broken anchor has been retrieved. It is an older stainless steel plow, and got hooked sideways on a coral head and then pulled hard at 90 degrees to the blade. It snapped right at joint between the blade and the shaft. There are obvious signs of 'crevice corrosion'. Those stainless steel anchors sure look pretty hanging off the bow, but they have no place on a cruising boat as a primary anchor. By yesterday morning, the winds had calmed enough and switched to about 120T (from 135T) and we were getting enough protection that the waves weren't too bad. We were still getting periodic squalls through, but the wind between the squalls was 'only' 20 knots. Once the weather broke a little, we continued with the cruisers-helping-cruisers activities. Dave from Soggy Paws and Jerry from Challenger held a mini refrigeration seminar over on the big catamaran Sete Mares. The two of them had just finished reviving Jerry's plugged evaporator plate refrigeration system. Meanwhile, Avril from Dream Away and I were swapping Tongan cruising guides, waypoints, and utility programs. We also managed to brave the heavy chop in the anchorage to go ashore and help James, the head Park Ranger, with his computer issues. The forecast shows continued easing of the wind, and a little more backing to the NE. We are looking forward to enjoying more of the charms of Suwarrow in the coming week. If today was one of those days that defined much of the best part about cruising, tonight provides a stark counterpoint, reminding of us of what all of us hate about cruising. We have had a pretty mild summer, weather-wise. And in the last 2-3 weeks it has been exceptionally fine--winds less than 15 knots and sunny skies. But tonight, sitting here in this remote atoll of Suwarrow, we are having the worst night I can remember of this whole cruising season. The wind is howling at 25 knots, it's drizzling rain off and on, and the wind direction is such that we're not in a very protected spot. It's a pretty good anchorage in winds anywhere from NW to ESE, but tonight the wind has gone to SE, and we've got nearly a 5 foot 'chop' rolling into the anchorage. The wind was pretty nasty last night, but eased off during the day. However, the forecast for the next 24 hours is for really crappy conditions. In the late afternoon, the wind started to come back up again and swing more SE. And just at dusk, when most of us had already gone ashore for a potluck (scheduled before the weather forecast was announced), one boat actually broke their anchor. They actually snapped the shaft of their 'CQR'!!! Wow, that would really be a bummer. Fortunately, it happened while they were aboard, and during daylight. So it was only a 'fire drill' and not a disaster that would have put their boat and their dreams on the rocks. The 'engineers' in the fleet haven't had a chance to look at the anchor, but they surmise that it was one of those cheap Chinese knock-offs that are not properly hardened. Fortunately they were still onboard and noticed their boat adrift. They have re-anchored with a backup anchor, but that's pretty unsettling. We have our big '2 sizes up' Delta anchor out. It is well set--buried in deep sand and checked and double-checked this afternoon. We have heavy oversized chain, and 2 snubbers on. And we tied a second line off to an old submerged mooring that I found while snorkeling around the boat. I wouldn't trust my boat to it, but there's chain down there, around a coral head, and a big line coming up. So it's a backup attachment that we hope we'll never have to test. So we should be sleeping well. But the wind is howling in the rigging, and the boat is pitching. We are surrounded by our friends, all of whom have most of their money and all of their dreams invested in their boat. Some of whom are maybe not as well prepared as we are. It's one of those nights where boats break lose. We are all on a "lee shore" right now. It would be a bad time/bad place to break lose. Today has been a day full of illustrations of one of the great things about the cruising lifestyle--that of "cruiser helping cruiser". In today's modern world, especially in the litigious USA, having someone take time out of their busy day to help another, just out of the goodness of their heart, is a rare thing. - Loose Pointer's dinghy painter parted in the high winds last night, and they asked for someone to take them down to where they could see it beached to leeward, to retrieve it. Kennedy on Far Star volunteered and spent an hour or so helping them retrieve the dinghy and get it operational again. - Jason on YOLO has an intermittent problem with an engine alarm on his boat, that he can't seem to find the source of. Several guys went over to YOLO at his invitation to go over what he had done and offer advice. Several other guys, not very diesel-savvy, also went over to listen to the troubleshooting discussion for their own edification. 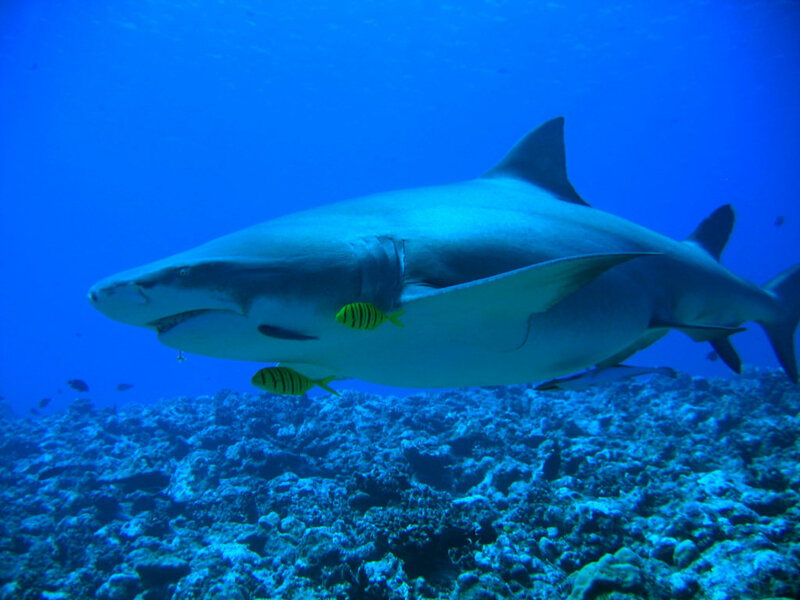 - Saviah called on the radio and said they had several severe wraps around coral heads that they had been unable to clear, and was there someone with tanks who could help out. They want to move to a better spot for tomorrow's big winds. Dan on Loose Pointer volunteered to snorkel and give directions while they tried to clear it (a 3rd hand is critical), and Warren on Night Fly offered to dive on it if that didn't work. - Night Fly has fuel problems--he got a bad lot of fuel somewhere in French Polynesia and his engine quit coming in the pass. Several boats have loaned empty fuel jugs so he can empty his diesel tank out. Loose Pointer loaned a small hand pump to help pump it out. Dave on Soggy Paws loaned his Baja filter (Warren's is no longer filtering properly), and some biocide to kill the growth in the tanks. - Eden has a problem with their outboard motor--the battery on their electric start is dead. Several people offered advice on both reconditioning the battery and starting manually. Jason on YOLO offered the loan of a small battery for a few days. - Marie Andree on Sete Mares has been nearly disabled by back problems, so Jo on Blue Moon has been giving her daily massages. - Jerry on Challenger has refrigeration problems, so half of his refrigerated goods are in Soggy Paws' freezer, and half in Far Star's refrigerator. Dave from Soggy Paws has been helping Jerry with his refrigerator issues, with Jason from YOLO looking on, trying to learn. They borrowed a set of 134a gauges from Dreamaway. - Zephyr is looking for help getting the AIS input into their computer charting program. Sherry on Soggy Paws has volunteered to help out. - Tomorrow Dave is holding a 'Refrigeration Troubleshooting' session on Sete Mares (a big catamaran with a big cockpit), and anyone who's interested is welcome. - And of course there are the information swaps--discussing routes and weather and anchorages. Soggy Paws is regularly handed a 'thumb drive' and asked for a download of our 'Pacific Cruising Info' folder, plus weather updates, and utility programs. - There is a book swap here, in the Ranger's area. But if there wasn't a convenient one nearby, someone would arrange a book swap on the beach at happy hour. Nowadays cruisers are also swapping DVD's, music, and ebooks on a regular basis too. Anyway, it is precisely this spirit of community that is one of the big things that we love about the cruising lifestyle. Used to be pretty common in America, but it is pretty rare now. We came in the pass at Suwarrow at 0800 this morning. We spent the night lollygagging around trying to sail comfortably without arriving too soon. It really is hard in decent winds to slow down. If you pull in too much sail, the boat rolls uncomfortably. So it is always a challenge to slow down. But we managed to jog along at about 4 knots for most of the night, with teh wind a little aft of the beam. We originally thought we'd go around the south side of the atoll and hang out on the 'back side' for the night. But the winds picked up later than forecast, so we would have arrived at the south end of the atoll too late. And, on more thought, it would mean we'd have to be very vigilant on watch because of our proximity to the reef. So we changed our plan at midnight, and decided to reach up on the east side, a comfortable 10 miles east of the reef, and gybe at around 5am and reach back for the pass. This meant we had to take the spinnaker pole down (15' long and 4" in diameter) in the middle of the night. But with a moon and reasonable conditions, it was no big deal. Dave hates to handle the pole at sea--we normally set it before we go out into the ocean, and wait to take it down until we arrive. But we did need to get it down. And with our big pole, one end is permanently affixed to the mast. So the 'pole dance' isn't a real big thing. Dave handled the controls at the mast and I handled the outboard end of the pole--assisted with the foreguy and afterguy. We bring it down until the pole end is at the lifeline, attach it to the lifeline to stabilize things, and then get the topping life, foreguy, and afterguy all sorted out. Our pole stores on the mast, so once all the lines are detached, Dave hauls up on the pole and I attached it to the ring on the mast. Simple (in 15 kts and 5' seas). We had a good set of waypoints for the pass, and though it was a little early for 'good light' the reefy points we needed to avoid in the pass were all breaking, so easy to see. I would have hung out for another hour, but Dave wanted to go in. By the time we got the mainsail down and went into the anchorage, the sun was up a little higher and we could easily see the bad spots around the anchorage. Our anchoring was much facilitate by the fact that about 5 boats pulled out this morning, leaving some nice gaps for anchoring. A few weeks ago the boat population peaked at 29 boats. We now have only 11 boat, including us. We anchored once in deep water (55'), but once we learned that a couple of catamarans were leaving that were closer in to the island (and therefore better protected from the 20+ knots forecast for tomorrow), we pulled our anchor and moved closer in to take their spot. The Rangers in their nicely accented (Australia/NZ) Cook Islands accent, came on at 0830 with a short VHF net. They said goodbye to the boats leaving and welcome to the boats leaving. 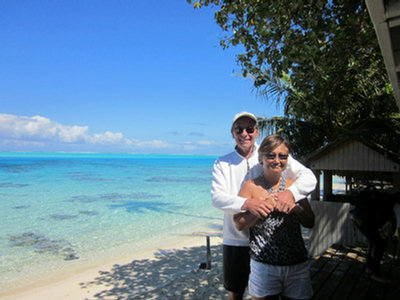 They told us to come in when we were rested to do the formalities (clear into the Cook Islands). Can't wait to meet them! Last night on Dave's watch, our navigation computer, an older Dell laptop that we've had for a couple of years, suddenly came up with a Windows Activation Alert. Dave swears he didn't do anything unusual. He said he accidentally shut the computer down (instead of sleeping it as we normally do when underway). When he restarted it, the 'Windows Activation Needed' banner came up and stayed in the lower right corner. This computer hasn't been connected to the internet in about 2 years, and we've never had any activation warnings before. It is a Dell we bought used and has a Windows XP sticker on the bottom that looks legit. So I wasn't too alarmed until I rebooted it again, and a warning came up that we'd have to activate in 3 days or Windows would stop working. !!!! There was a convenient 'Click Here to Activate' button. Anyway, holding my breath that we wouldn't move out of the Iridium 'cell' and drop the call in the middle of the process, I interacted with the voice-prompt computer to say the 54-digit number that was displayed on my Activation screen. It was easy, with the computer prompting for each number group in turn. The only hitch was caused by me mis-reading one of the numbers, but 'he' gave me several chances to re-read the number. Then the computer read off my activation code. Again, slowly, clearly, and in groups that matched the fields on the screen. Click to finish, and Walla! I was activated again. Guess we're good for another 2 years. Sheesh--fortunately, even if we couldn't resolve the problem--we have 3 other computers aboard, all configured to be able to plug and play as the Navigation computer. But what next, Microsoft!??? We motored all day yesterday in mostly glassy conditions until 1am. At our 'change of watch' time, the wind had come up to about 8-9 knots out of the ESE. Since we knew we'd arrive after dark tonight no matter what we did, there was no need to keep motoring once there was enough wind to move at all under sail. So we set the sails in our nice stable 'Dead Down Wind' configuration, and were surprised to be moving along at nearly 4 knots. We had a nice quiet sail the rest of the night. Now we are going too fast. Our current ETA at the current speed (10am) of 5.5 knots is about 2am tonight, and the wind is forecast to build to the 15 knot range, so we will probably go even faster. The problem with slowing down is twofold... First, we have been bitten before by slowing down, then have the weather change. Second, to slow down you have to reduce sail, and reducing sail in seas means that you roll more. So we'll keep on at a reasonable speed, and plan to tuck up behind Suwarrow whenever we get there, and heave-to or sail slowly back and forth until daylight. (Dodging our 2 other friends who will also arrive after dark). We do want to get in as early as possible tomorrow (Saturday), because the winds are building, and the sooner we get in and get settled, the better. The forecast for Sunday is for winds over 20 knots from the SE. Hopefully there will be plenty of room in the anchorage for us to tuck up into a protected spot for the higher winds. The boat count at Suwarrow is now about 12-15 boats, and our little group's arrival will add 5 more. And the normal anchorage is a little exposed to strong SE-ly winds. If the normal anchorage is too crowded, we understand we can get permission from the Rangers to move to a place a short distance away called 'Seven Islands', which is well protected from the SE. Still having a pleasant sail in mild, sunny conditions. Looking forward to our arrival in Suwarrow! Wind NE at <5 kt Seas confused! Well, we had 2 1/2 days of perfect sailing weather. But the wind started to drop last night (as anticipated), and at 6am Dave couldn't stand the slopping of the sails any more, and turned on the engine. We anticipate having to motor for at least 12 hours, maybe 24, before the wind fills back in. We still expect landfall sometime Saturday. Right now (11:30am), the sea is glassy and what sails we do have up are hanging slack. But it beats 20-25 WNW that our friends are having further south. Our friends on Dreamaway are in sight, about 3 miles ahead of us. We are amazed that we've stayed so close together without really any collaboration. We've had trouble staying this close to Infini after 3 days of sailing in the past, when we've been TRYING to stay close! I've just finished reading Tom Neale's "An Island to Oneself" about his stay alone on Suwarrow in the early 1960's. Interesting reading, and especially poignant when approaching 'his' island for a visit ourselves. He once spent 13 months without visits from any boats. But now, with GPS, and the internet (sharing of cruising information), they regularly have ~120 boats a year visit. The island is once again uninhabited, except seasonally, 2 Park Rangers are placed on the island to watch over and facilitate cruisers' visits, from April to November. Folks might wonder if we're going to interesting places like Palmerston and Aitutake, as well as Suwarrow. We are not. The Cook Islands are scattered all over the middle of the South Pacific. Cruisers going between French Polynesia and Tonga generally need to make a choice between the Southern Cooks route, which include either Rarotonga or Aitutake, and then typically Palmerston, Beveridge Reef and Niue. Or via the Northern Cooks route, which includes Suwarrow, and usually a stop at American Samoa and/or Western Samoa. We could spend a month out here and hit them all, but these islands/atolls are about 300 miles apart, so it would be logistically difficult and a lot of sea miles. Plus we'd be dodging cold fronts this time of year. We chose the northern route for two reasons--Tom Neale's "An Island To Oneself" is set in Suwarrow, and so it's a cool place to stop. It is now a park, and two Cook Island Park Rangers stay there during cruising season to shepherd the passing cruisers through the atoll. They make it a point to show the cruisers an interesting time. Our friends have just raved about the experience. The second reason is that the northern route seems to be north of the passing cold fronts. We are congratulating ourselves tonight on our choice, after hearing friends on the radio enroute from Aitutake to Beveridge Reef going through a cold front with 25 knot NW winds. Yuk! We, on the other hand, have 12 knots of gentle northeasterly winds. We are about 350 miles north of them, headed more north, and should not get much weather from the passing cold front. (Remember that we are in the Southern Hemisphere, so north means warmer down here...). The season right now is 'late winter'--the Northern Hemisphere equivalent of February. Get out your Google Earth! Chocolate Ice Cream in the Middle of the Pacific Ocean! Our new freezer is doing a great job off keeping ice cream cold. Dave loves chocolate ice cream so much that we finally broke down and bought some in Bora Bora. We are enjoying the sunset and eating ice cream, on a beam reach. It doesn't get much better than this! Wind NE at 13 kt Seas confused! We have had a lovely 24 hours. The wind has been pretty steady at 12-14 knots, and shifting in a favorable direction. The seas have been going down, the weather fair, and we have a full moon for most of the night. We've hardly had to touch the sails in 24 hours, and the only messing with the autopilot has been to tweak it to point more at our final destination. We are still in VHF contact with Dreamaway, who left about 45 minutes behind us. They are about 10 miles ahead of us. We've been monitoring and checking in on several SSB nets. First, the afternoon 'South Pacific Cruiser's Net' and the morning 'Pacific Reef Runner's Net'. These two are nets set up by different groups of boats that are 'puddle jumping' this year. So they are moving nets that will likely disband as the boats arrive in Samoa and Tonga and form up different nets for their onward passages to NZ or Australia. We have also been checking in on the evening Pacific Seafarer's Net--our old friends based in Hawaii, California, and NZ who track Hams on boats all over the Pacific. Plus we tried to tune up the Fiji-based 'Rag of the Air Net' (8173 1900z) this morning--but copy was poor--maybe it will be better tomorrow as we get closer to Fiji. Our current sailing conditions are fantastic, but they are forecast to get really light tomorrow. We have about 24 hours of barely-sailable wind, as a front passes south of us, and then they should fill in for our last 24 hours to Suwarrow. Though we are sad to miss hooking up with many of our friends in Suwarrow, we are happy to hear that the big wave of boats there has started to move on to American Samoa and Tonga. They set a new record of 29 boats in Suwarrow at the same time this year, about a week ago. We have been dragging our heels on the way there, hoping that the numbers will be down by the time we get there. It's a remote place that should be enjoyed by 'less than a mob'. And of course, anchoring will be easier in the deep water with fewer boats to worry about. We are sad to report that one boat we are acquainted with, Ri Ri, was lost on the reef at Palmerston Atoll yesterday. We haven't been able to get all the details, but Ri Ri was on a mooring there and apparently broke free. (no word yet on whether it was mooring equipment that failed, or boat-based equipment, and how they got so stuck so fast that they couldn't get off). A huge effort was made to pull her off the reef, but they eventually gave up that effort and started just trying to salvage stuff inside. So Frank and his girlfriend are fine, but are sitting on a pile of used boat gear in Palmerston, wondering what to do next. Very sad. As always, a number of cruisers are headed for Palmerston to help out as much as possible--and one has already promised them passage on to Tonga when they are ready. We had an easy exit from the pass at Mopelia. Conditions in the pass were better than we'd seen it since we'd been there. The current was still ripping out at 3-3.5 knots, but there was no incoming swell, so it was flat calm. We flew through the pass at close to 8 knots, with no incident. After a "Man Overboard Drill" to retrieve Dave's hat (outside the pass, in the calm waters) we had the sails set and on our way by about 9:45am. It was a beautiful day, with about 15-16 knots of wind, well south of east. Of the 5 boats that set out around the same time (Soggy Paws, Dreamaway, Loose Pointer, Blue Moon, and Night Fly), all set out on port tack to take advantage of the southerly direction of the wind. The forecast is for the wind to back to the NE eventually, so staying a little south of the rhumb line will enable us to gybe to starboard tack when the wind goes NE. We didn't bother fishing--too many other distractions, and Dave doesn't like cleaning fish underway. So we fish when coming into an atoll, but not on leaving. Though from our diving, the fishing near the pass should be fantastic. We saw Wahoo, Tuna, Jacks, and big Snapper on our dives. We set up in our Dead Down Wind (DDW) configuration, with the Genoa poled to port, the Main vanged to starboard, and the Staysail sheeted in tight to starboard (to stop the rolling). In 15 knots of wind, this is a very stable and reasonably fast configuration for us. In the last few downwind hops, we have tried other configurations and none has worked as well. (Genoa alone on a pole, genoa and reefed main, etc). With this configuration, we have about 45 degrees of directional latitude, so we could accommodate the slow wind shift without a lot of sail handling. We sailed like this all through the day and until our 1am watch change, when the wind had backed around to a more easterly direction, and we threw the main over to sail on a starboard tack broad reach, in a WNW direction. Unfortunately, the wind had eased during the night and we're slopping around a bit, but it's not too bad. Our speed is down to about 4.5 knots. Current ETA Suwarrow is mid-day Saturday. 457 Miles to go. We have had a wonderful time here at Mopelia (aka Mauphaa). The wind has been calm, the anchorage lovely, the friendship and activities outstanding. Boats here: Soggy Paws, Don Quixote, Night Fly, Loose Pointer, Dreamaway, and Blue Moon. We have had campfires on the beach every night, and every day there was another activity--diving, snorkeling, beach walking, coconut crab hunting, lobstering (at night), and always someone to do it with. We could easily stay here for a month. But the wind has filled in and there's a good weather window for the 4-5 day trip to Suwarrow. Don Quixote left yesterday for Aitutake, and everyone else is leaving today for Suwarrow. I hope to get back-post more details and pictures from our time here. But for now... have to go get ready to haul anchor! Almost all of our friends have hurried out of French Polynesia--mostly because their 90-day visa is up, and there is NO EXTENSION POSSIBLe once you are 'in country'. Some have set off on the Southern Cooks route... Aitutake - Palmerston, etc. Others have set off on the Northern Cooks route... Suwarrow. One boat has actually gone north up to Penrhyn, and then on to Suwarrow. But there are two seldom-visited places at the tail end of French Polynesia (after we have checked out)... Maupiti and Mopelia. 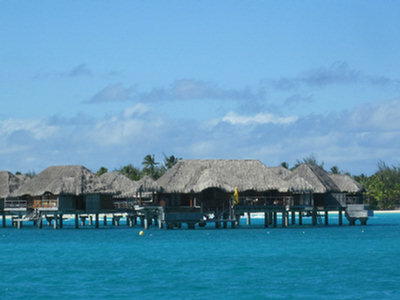 Maupiti is only 25 miles from Bora Bora. But it is a little problematic this time of year--the pass faces south and if there's much of a southerly swell running, it can be impassable. We wanted to go there, but with the current weather, we could get in, but might get trapped there for a few days. So we chose instead to go directly to Mopelia. Mopelia is 130 miles downwind from Bora Bora. There used to be a village at Mopelia, but a large cyclone in the 90's swept the town away. Now there are only a couple of families living in the southern motu. There is no store. There is no supply boat. There are no charter boats. There are no tourists. Our friends on Don Quixote made an unplanned stop here a couple of days ago and have said "we may never leave". 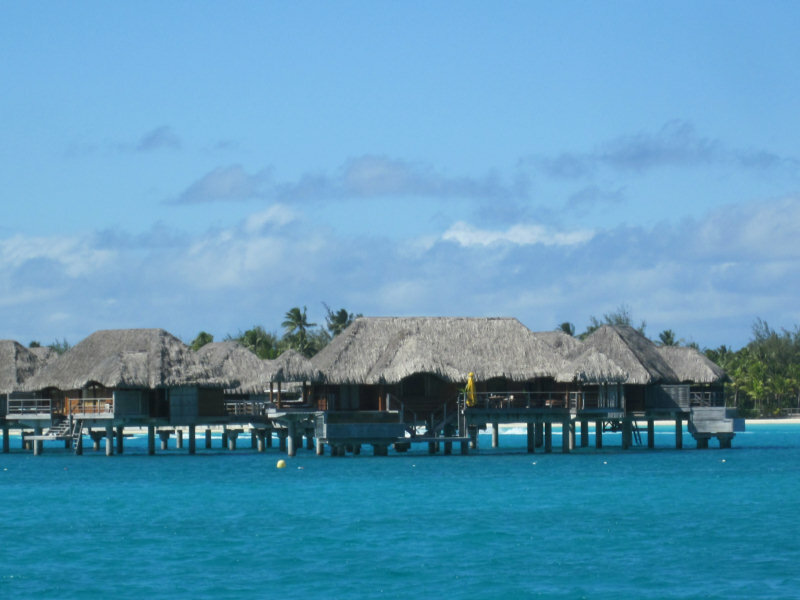 It is a Tuamotu in the Society Islands--far from the tourist crowds--almost unihabited--great diving--beautiful beaches--clear water. (See Don Quixote's blog link on the left). We made the overnight jump last night, and came in the pass an hour ago. We too think we have arrived in Paradise. Arriving boats can pick their own half mile of deserted beach to pull up in front of. We are anchored in 20' of sand, near some nice snorkeling coral heads, off a beautiful palm-studded white sand beach. Another boat here, Loose Pointer, just made a dive outside the pass and said it was the best diving he has done in a LONG time. The weather will be too light to head NW to Suwarrow for 4-5 days. So we are 'stuck' here til at least the 15th. Darn!! Bonfire on the beach tonight--full moon. Wish you all could be here with us!! We worked hard for 2 days--even passing up a chance at a hike and a scuba dive--to get ready to leave this morning. Sunday was spent reorganizing our boat for 'at sea' conditions, and putting away the toys (kayaks and bicycles) we got out for Fred & Suki's visit. Early Monday morning, we left our nice mooring (and good wifi) at Bloody Mary's and headed for town, where we fill up with fuel, got groceries, and checked out of French Polynesia for good. Once we got our town chores done, we moved to the pretty anchorage west of the north end of Motu Toopua. This is a really nice spot--pretty, somewhat remote from town, and with OK wifi. Wish we could have stayed there longer. But it was time to move on. We sailed out the pass at Bora Bora at 0845 this morning, and saw a couple of whales!! What a nice start for a passage. We have been mostly running Dead Down Wind (DDW) all day. We are using the 'Tom Service' configuration--genoa on a pole to windward, main vanged out to leeward, and the staysail in the middle. This is surprisingly stable, even in pretty big seas. Our autopilot will hold a course with this configuration pretty well, and it's the maximum sail area we can spread. In the late afternoon, we tried going over on a starboard tack for awhile. It worked for a bit, but then the wind came around, and we went back to our DDW configuration. The wind is only about 12 knots, and the seas are calming down. But we would like to make the pass at Mopelia by about noon, so we are hoping for a couple of more knots of wind. For awhile we were only making 3.8 knots, and that wouldn't cut it, but we are up to about 4.5-5kts, which will do fine. We had a great time with my cousin Fred and his wife Suki here. This was Suki's first ever experience on boat this size, and the first time she had ever slept onboard. But both Fred and Suki were very adaptable and were great boat guests. They are welcome back any time. They pretty much got to see the whole island. 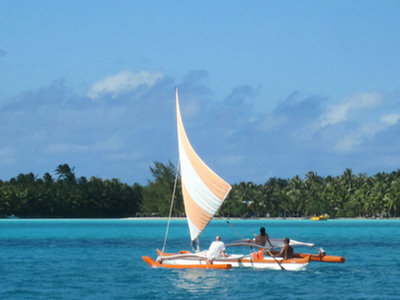 You can't circle Bora Bora in a sailboat--the south end of the island is too shallow. But we went diving and the dive boat actually gave us a pretty good 'lagoon tour'. Fred did a refresher dive one afternoon, and the next morning Dave and I and Fred did a Manta dive and a Lemon Shark dive, while Suki hung out in the dive boat. We did see at least one Manta and a number of lemon sharks. 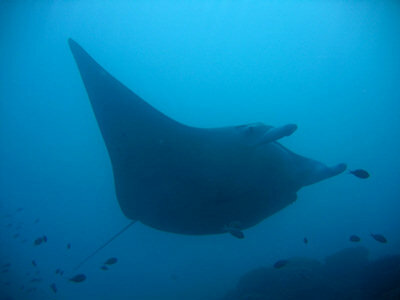 The Manta dive is inside the lagoon, and so the water was a little murky. Dave did a great job with the camera to get this shot. 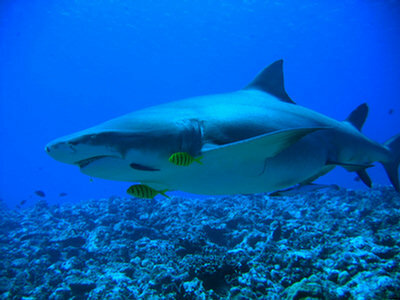 But the visibility for the Lemon Shark dive, outside the reef, was really nice. It's been awhile since we've seen such clear blue water!!. For those who are wondering, it costs $150 for a 2-tank dive, which includes pickup from any hotel or your boat. 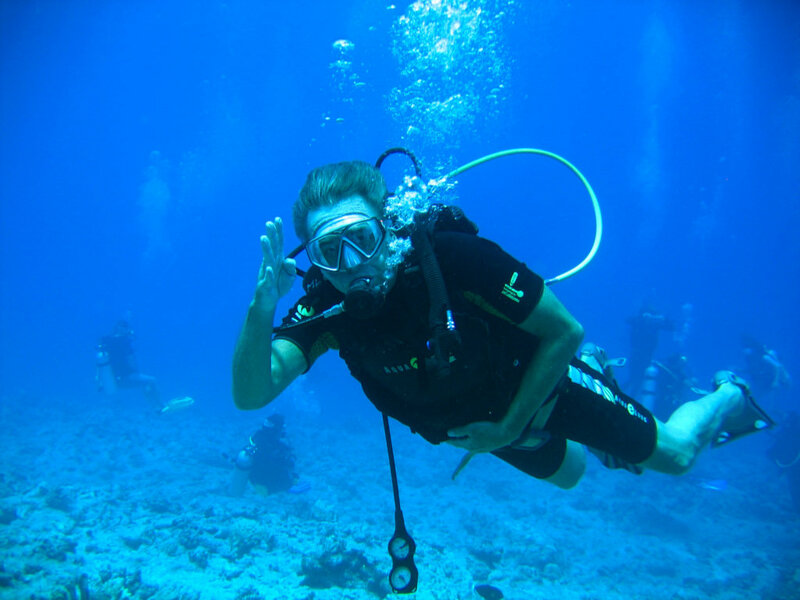 We used Bora Diving, and liked them a lot. On their last night, Suki had booked a room in the 5-star Le Meridien Hotel. So we anchored off the hotel the night before and took them in after lunch to check in. They got one of those neat bungalows over the water, with a glass floor. You can snorkel right off your porch. We enjoyed their nice hot shower and sundowners in their room, and then went to the seafood buffet with them. After dinner was a 'Tahitian Dance' thing, but we thought it was even lamer than the one we saw at the Community Center in Huahine. Maybe it is because it is after Heiva has ended and everyone has hung up their grass skirts for the year. We left them yesterday to enjoy the luxury of their hotel on the last day, and took Soggy Paws back around to the west side of the island. We ended up at the World Famous Bloody Mary's Bar. They have free moorings if you come in for a meal or a drink. We had 2 beers and 2 delicious designer cheeseburgers. It cost nearly $50, but was worth it. Late in the afternoon we went for a good snorkel in the dive area E of Pt. Matira. (see the Societies Compendium for specific waypoints for anchorages and dive spots). Most of our friends have already left for points west (mostly Suwarrow). So we are ready to move on too. We can't check out until Monday, and we need to do some provisioning and refueling on Monday too. Then we will try to leave fairly early Tuesday. The weather looks good for a 24-hour run to Mopelia, the last atoll in the Society Islands.